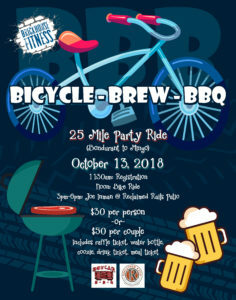 What could be better than riding a bicycle, drinking beer, and enjoying a great bbq sandwich? Nothing. The answer is, nothing. That’s why you should mark down October 13th on your calendar and attend the fun in Bondurant. This second annual Bicycle-Brew-BBQ ride starts in Bondurant at Reclaimed Rails Brewing Co. Registration and breakfast drinks will be happening from 11:30-noon. At noon the 25 mile ride will take off on the Chichaqua Valley Trail for the park in Mingo. Waiting for you in Mingo will be a free-will donation for food on the grill and drinks. There will also be some live acoustic music for your listening pleasure. Hang out there as long as you would like. When you return back to Bondurant, live music will be played out on the patio from 3-6pm with food and drinks available from boxcar bbq and reclaimed rails. AND then even THE GREATEST live music provided by someone we haven’t found yet… but it is going to be the greatest. -Check-in/Registration is from 11:30-noon. Ride takes off at noon. Food, music, and drinks on the reclaimed patio at 3pm. -Cost is $30 a person OR $50 for a 2-person registration (find a friend). This includes your ticket for the prize raffle, a BBB water bottle, a pint of Reclaimed Rails beer, and a sandwich from Boxcar BBQ. If that’s not worth the $ then you can slap me in the face and give me a wedgie. -The entire route is on a bike trail with only a handful of street crossings. -Beer and food available for purchase for those who are not participating in the ride. -Ticket purchase available on EventBrite. Register by October 1st to ensure you get a water bottle. Registration the day of the event is available.